I've been really busy this week ... knitting balls for my Christmas tree, shopping for pressies and waiting for the delivery man to arrive with on-line purchases. The Christmas tree is up and looking very twinkly. We all love hanging out in our cosy little den, where it holds pride of place, as we snuggle up to the fire. The weather has finally woken up the fact that it's winter, which has helped get us all into the festive spirit. Emi's got another week of school, but he's already de-mob happy as they've done all the end-of-term assessments this week and he feels as though he's just cruising for the holidays. He's going to be nine on 11th December, and this Saturday he's having his birthday party with one of his best friends, who also has a December birthday. We've got twenty of their chums pitching up for a Scalextric Grand Prix party. Everyone is very excited, especially Mr B, who is really enjoying this second opportunity to play with boy's toys. They (Emi and Mr B) went to the Brick 2014 exhibition last weekend and came home so enthused about all the projects that they were going to make. Indeed Mr B spent much of his Sunday afternoon googling the best type of glue - yes, glue! - to stick their masterpieces together with, so that they would never have to be dismantled. Eeek! This is beginning to sound a little bit scary. 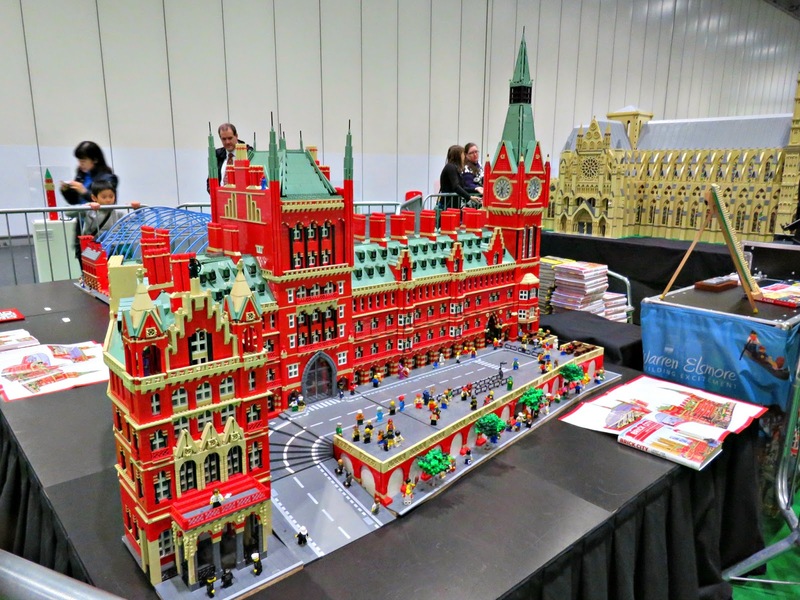 I'd hoped we would all grow out of the Lego phase so that I could smarten the place up a bit: big boxes of Lego and half-built projects littered about don't always hit the high design notes that I might otherwise aspire to. One of the things that they talked about for ages and ages was the Cube Stormer 3, a made-entirely-out-of-Lego computer that can solve a Rubiks cube in under three and a half seconds. It all sounded a bit unlikely to me, but they had made a video of the machine in action, which they showed me to prove that it really could do what they claimed. I've actually found a better video on YouTube: Cube Stormer 3 Video, which includes an interview with the engineer who designed it and a demonstration of what it can do. It's kind of incredible that someone should spend their free time building something as complicated and eccentric as this. Whilst my heart goes out to his wife, who appears to have lost the use of her dining room for quite some time, there's a little part of me that thinks it's really cool for someone to be so passionate about such an odd thing. It kind of epitomises the best of British eccentricity. And I can say that because I'm Irish, not British, and therefore not patting myself on the back when I make the statement ... .
Whilst my boys have been busy following their Lego dreams, I've been busy doing my own thing. I've made a load of Christmas mincemeat, which will be useful for knocking out some mince pies when friends pop in over the holidays. With a bit of ready-rolled puff pastry in the fridge I'm all set for those impromptu visitors who drop in over the holidays. I can knock out sausage rolls and mince pies in a flash. And how do you like my trio of retro-chic knitted Christmas tree balls? The first one is a Christmas Cockerel. You can find instructions on how to make him here: Rudolf, the Christmas .... cockerel (!) He was originally supposed to have been a reindeer, but somehow the nose looked much more like a beak, so I did a bit of jiggery-pokery (technical term in knitting) and turned him into a Christmas cockerel. At a stretch we could even pretend he was the main course for the Big Day ... . Number two was a little homage to the Union Jack. 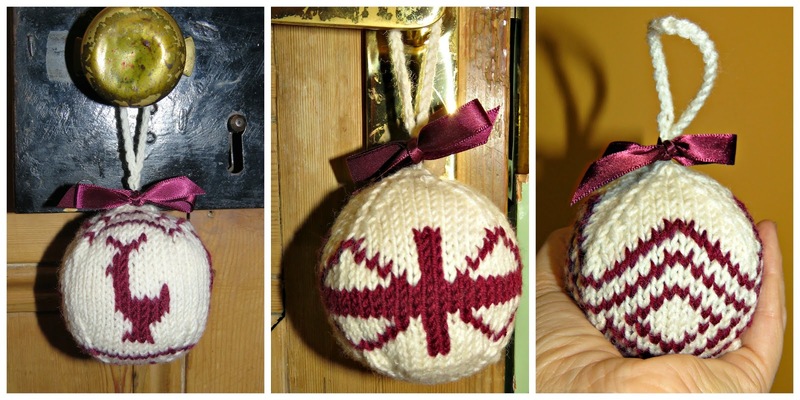 OK, maybe some imagination is called for ..., but if you'd like to make it the pattern is here: Union Jack Christmas Ball. And, finally, number three is my Christmas Diamonds pattern. Emi is getting so enthusiastic about all this drawing on squared paper and knitting up the picture business that he's designed a Christmas Ball of his own. It features a Churchill tank with a great big gun mounted on a turret. As a festive motif if may be limited appeal save in the case of an esoteric audience of eight, soon-to-be-nine year-old boys who play World of Tanks on line. I am smiling from ear to ear as I read your post. Your Lego pictures bring sweet memories of my oldest son. His is 27 and STILL builds Legos. I love seeing that the boy remains in the man; his face lights up when he talks of his latest Lego creation. And your knitted ornaments are beautiful. What a special talent you have! I may try knitting again this winter. I've not been able to get the hang of it so far! Such a joy to read about your life . . . The Lego pics are amazing. I can't imagine building one of those, but when I got to the Christmas bells, wow. Legos have changed so much since I was a kid. I wonder how long it will take your crew to make their 'masterpiece'. I have several 'masterpieces' of my daughter's in the basement, although the all are smaller than a breadbox. 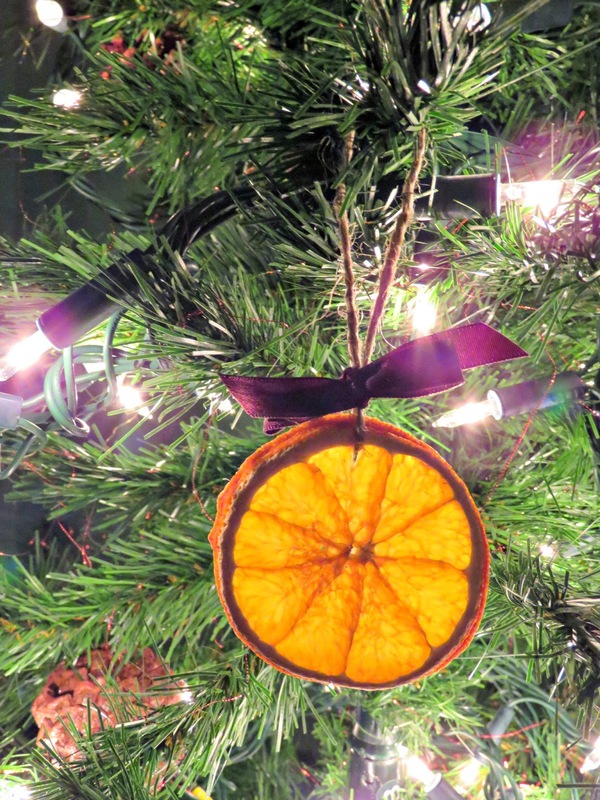 :) Your ornaments look wonderful. I have yet to get started on my Christmas decorations. Have a great weekend! 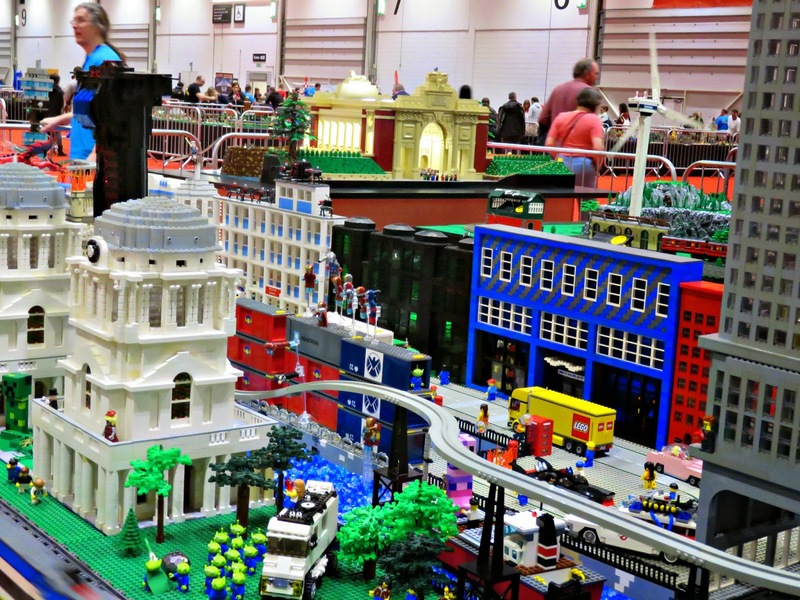 Funny to see the Lego Models .... We living near the LEGO Town Günzburg! Thanks for sharing your photos, Bonny. Happy second Sunday of Advent. 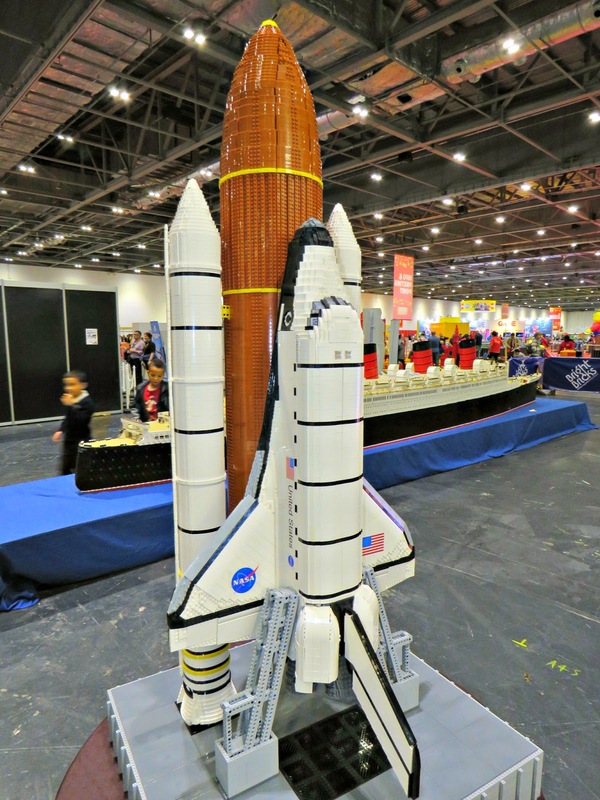 Those Lego buildings and projects are quite impressive. I really like St. Pancras Station - this is the station we went into London and out of it every day for almost a week this June when we were in Europe. And of course we took off for Paris from there on the Eurostar which I never did while I was still living in Europe (go figure). 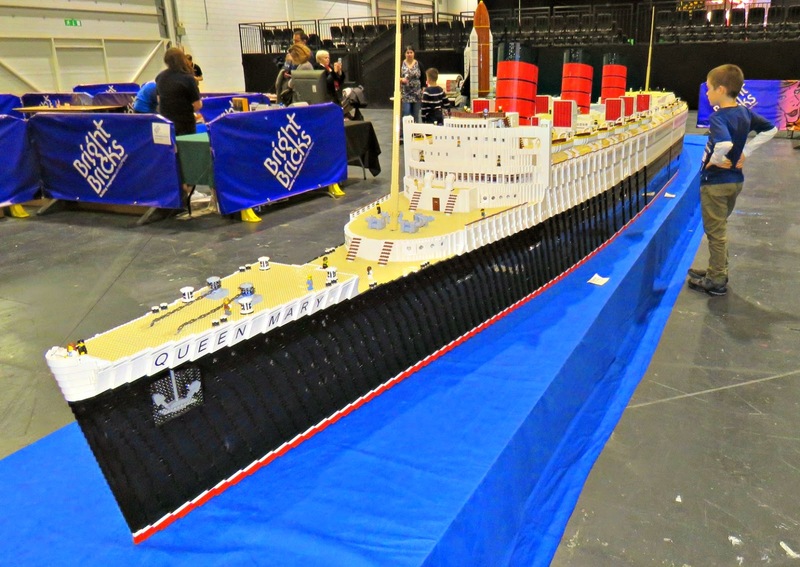 But I really like the Queen Mary - she represents its hugeness quite well!